Bearings are one small component of our new zip line trolleys, but they are also one of the most important components. The new LightSpeed EZ Clip Zip Line Trolley and the new LightSpeed Micro Zip Line Trolley feature four ABEC rated bearings per trolley. These premium bearings increase the trolley’s lifespan, allow for higher speeds on the line, and make it a smooth ride down the line. In other trolleys, the bearings are one of the first thing to fail and are often the reason zip line trolleys have to be retired. The engineers went above and beyond what would be “enough” and gave our new zip line trolleys high quality bearings that will last longer. Read on to find out why bearings are important for zip line trolleys, and the ways that our bearings make our trolleys better. A bearing is a mechanical component that allows movement and reduces friction between two parts. Instead of two smooth surfaces sliding past each other, which would cause lots of friction, bearings support the movement and reduce friction for less wear on the parts over time. Ball bearings and cylindrical roller bearings actually roll, but bearings can also use liquid, gas, or even magnetic fields. There are numerous applications of bearings that you likely use on a daily basis. Your car’s engine, driveshaft, and steering column all use bearings. The hard drive on your computer and your office’s photocopier and printers use bearings. Bearings are used in household items such as washing machines, driers, and food processors. 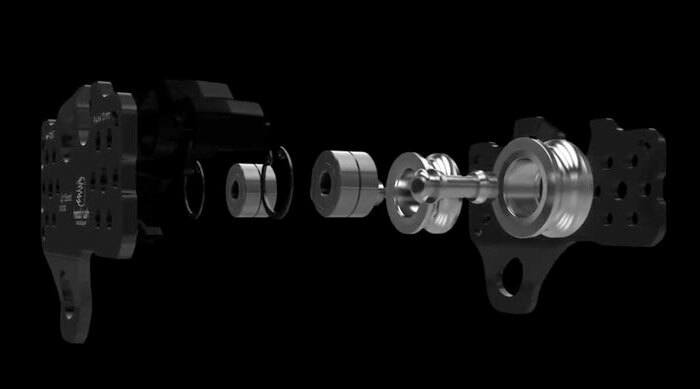 If you ride a bike, skateboard, or rollerblade then you are using bearings again. Or if you ride down a zip line – zip line trolleys have bearings that help them roll. Why are zip line trolley bearings important? In zip line trolleys, bearings are used inside the sheaves to let the trolley roll smoothly. (Sheaves are those things that some might call the zip line trolley wheels.) Zip line trolleys can achieve high speeds while traveling down a zip line, and that speed can cause a lot of friction and heat inside the sheaves. High quality bearings reduce the amount of friction which reduces the amount of heat and in turn causes less wear on the trolley over time. Bearings are the first thing to fail on many trolleys. We wanted to make a robust trolley with a longer lifespan, so our EZ Clip and Micro Zip Line Trolleys feature precision bearings. One bearing per sheave would have been more than enough, but we doubled down and put two inside each sheave. This distributes the load of the rider over 4 separate bearings so they don’t have to work as hard and so each bearing lasts longer. The bearings themselves are high performance bearings that are ABEC rated, have a steel cage, and have a metal shield. We’ll cover each of these features and why they make our trolleys better. What are the different parts of a bearing? This diagram shows the parts of a ball bearing similar to the bearings inside the EZ Clip Trolley and Micro Trolley. There is an inner race and an outer race, and these races will have grooves for the balls to roll along. The bearings inside our trolleys have 7 balls each. The balls are held between the races by a cage (also called a retainer) that maintains symmetrical spacing of the balls while allowing them to rotate freely. The final component is a shield that protects the internal pieces from contamination while helping hold in the lubricant that surrounds the balls. One of the many components that make our bearings (and our trolleys) better is the cage. Other trolley bearings use a plastic cage, but our bearings have a steel cage. You can imagine the heat that is created inside the sheaves as a trolley rolls down the line at high speeds. This heat can quickly damage a plastic cage, but a steel cage is much more resilient to heat damage. High quality bearings may meet certain standards that allow them to earn an ABEC rating. The ABEC rating given to a bearing is a measure of the uniformity of the shape and surface of the bearing components. Bearings can be rated ABEC 1, 3, 5, 7, or 9, and the higher ratings represent lower tolerance for variation. The ABEC rating does not apply to factors such as material quality, load capabilities, lubricant, etc., so it is one measure of the quality of a bearing. Get more in-depth information on ABEC ratings and bearing tolerances. Our engineers selected ABEC bearings for use in the EZ Clip and Micro Trolleys, and the bearings are made with high carbon steel from Japan. These bearings allow our zip line trolleys to be rated for running speeds up to 75 miles per hour. Even at high speeds, our trolleys will have a longer lifespan in large part because of the quality of the bearings. What does it mean for a bearing to be shielded? There is a cover that sits over the balls and cage of the bearings and between the two races. Sometimes that cover is made of rubber and fits snugly inside the opening. A snug fit is beneficial because it keeps out particulates and water, but it also creates friction where the rubber seal touches the rotating inner race. This makes it prone to wear out quickly if it overheats because rubber and heat are not friends. The bearings inside the EZ Clip and Micro Trolleys feature metal shields that sit between the two races, but there is a tiny gap between the shield and the rotating inner race. That tiny gap removes a friction point, therefore reducing heat buildup and wear. A snug rubber seal may offer better protection initially, but the metal shield is much more resilient over time for better long-term protection of the internal bearing components. Bearings may be a small component in a zip line trolley, but they are extremely important to the lifespan of the trolley. We over engineered our EZ Clip and Micro Trolleys with four high performance bearings per trolley so they will last longer and increase ROI. Add an EZ Clip or a Micro Trolley into your zip line trolley fleet, and you’ll see the difference!